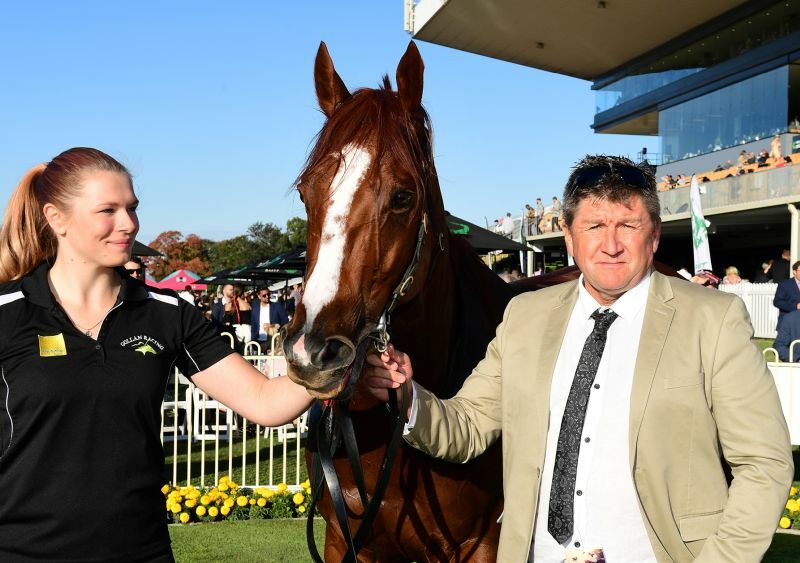 It was probably fitting that a horse named after a fine drop of red, Grande Rosso, should capture a race like the Listed GH Mumm Stakes over 1615m at Doomben. The win of the son of Woodside Park sire Written Tycoon was a return to winning form for a horse who had not won since capturing the Listed Chester Manifold (1200m) and Listed Barton Stakes (1400m) in rapid succession in January last year. The win represented the eight individual stakes winner for his Victorian champion sire this season and took his progeny earnings well past $9 million with the magical $10 million almost within reach. “Peter and Paul (Snowden) have done a terrific job with the horse in the three runs since he shifted to their stables earlier this year,” his owner-breeder Bob Manwaring pointed out. “They took the blinkers off Grande Rosso and that really seemed to settle him, while the ‘mile’ also appears to be ideal for the horse these days. I don’t think he’s a short courser anymore and wouldn’t be surprised if he ends up turning into a galloper that wins over longer distances. The Mumm Stakes win took Grande Rosso’s tally to nine wins, three at stakes level, and seven placings from 36 starts for $555,860, who was purchased at the 2013 Inglis Melbourne Premier Yearling Sale for $220,000. At the time, it would be the equal highest price paid for a Written Tycoon yearling that year. Woodside’s James Price reflected on how far Written Tycoon has come with progeny selling up to $1 million in 2017 and his fee in 2018 deservedly increasing to $110,000. “The Magic Millions Broodmare Sale (earlier this month) was another wonderful indication of Written Tycoon’s commerciality, with mares selling in-foal to him averaging $470,000,” Price said. Written Tycoon’s latest stakes winner Grande Rosso is the first foal of the Rory’s Jester mare Jestemma, who was bred at Rick Jamieson’s Gilgai Farm. She a half-sister to Listed winner Spinning Jenny and the stakes-placed Philda, a 12-time winner of over $433,000. Jestemma is also a half sister to Soorena, the dam of Group 1 Newmarket winner The Quarterback and the multiple Group 2 winner and Group 1 Australian Derby runner-up Philippi. Tragically, Jestemma died when producing a sister to his stakes star last spring. “She is by Written Tycoon, and a cracking type and will likely be sold at next year’s Gold Coast Magic Millions Yearling Sale,” breeder Manwaring adds. NEXT POST: Victorian breeders have Good ‘n’ Fast times ahead!